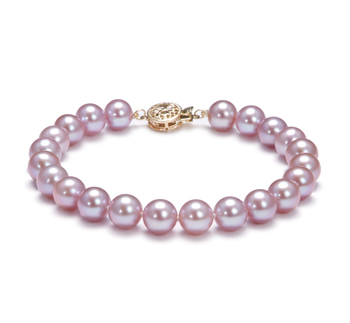 A lavender Freshwater pearl bracelet is a very delicate jewelry item that will subtly enhance any woman’s beauty. When worn on its own, it symbolizes an understated beauty that suits women of all ages. So let us help you to decide what bracelet you should be choosing. This very simple bracelet provides you with an easy way to include pearls into a jewelry collection. The various sizes pearls used in the designs we offer really make such pieces very versatile to wear. The smaller pearls would look lovely when you pair them with more casual outfits. Whilst a Lavender Freshwater bracelet that comes with pearls that measure between 8.5 and 9.5mm in diameter would look lovely when worn with semi-formal attire such as a business suit. Any woman would be happy to be presented with any kind of pearl jewelry even a beautiful Lavender Freshwater pearl bracelet. This would be the perfect event to present your wife with such a unique present. A pearl bracelet is a very versatile piece of jewelry that can easily be worn with various different outfits. The warm colors of the pearls will help to accentuate the beauty of your wife’s complexion, even more, when being worn. Such pearls suit women who have medium to dark complexions as well as women with much cooler ones. Such a present is suitable for giving not only to women but also to young girls. Teenagers will love the shimmering colors that bounce off the pearls as the light hits them and will look great when worn with very colorful outfits. As for older women, they will love how the beauty of these pearls adds a touch of elegance and sophistication as well as little warmth to a more formal outfit. They will certainly add a playful touch to any business suit. Why not think about presenting the woman you are going to marry with gold and Lavender Freshwater pearl bracelet. This is a design that will add a real touch of elegance and sophistication to her whole wedding ensemble. It will also provide them with a beautiful memento of such an important day in both of your lives. If you aren’t sure what shade of Lavender to choose then you may want to consider asking her mum for some help. She will be able to push you in the direction without giving away too much about what the dress your bride to be is going to be wearing on the big day. As these bracelets are very unique looking they make the perfect gift for you to present to your daughter on her graduation day. The simple design of each one of our Lavender Freshwater pearl bracelets that includes small size pearls will look very flatter when they wear it with casual or semi-formal attire. The touch of color will also help to lighten the mood slightly on what will be a very stressful but important day in your daughter’s life. It will also help to add additional softness to their features because of the warm glow that will emanate from it. It is important that before you make such a purchase you know the exact size bracelet you need to buy for the wearer’s wrist. This is especially important if a young girl or a teenager will be wearing the Lavender Freshwater pearl bracelet you are going to be buying. You will, therefore, need to find out what size wrist they have so you don’t end up buying a bracelet that doesn’t fit properly because it is too big or too small. Of course, if you intend for the bracelet to be a surprise you may want to enlist the help of a friend or another family member to help you find out just how small or large their wrist is.